With National Puppy Day taking place this Saturday, March 23rd, now’s the perfect opportunity to promote related retail deals all over your websites for your readers to see. Check out these fetching National Puppy Day offers now available through FlexOffers.com! 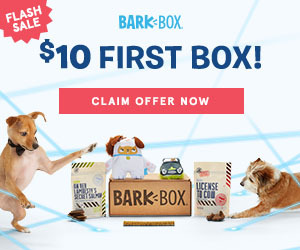 A leader in the subscription pet product industry, BarkBox has been a beloved and trusted brand for years. Each one of their shipments includes innovative toys, all-natural treats, and a chew to keep four-legged family members happy and healthy. As there’s a new theme every month, the fun pet pics to post up on social media won’t end either. From the good dog people at BarkBox comes Super Chewer, a monthly subscription box for those playful canines who really put their canines to work. Orders arrive with tough toys inside, as well as all-natural meaty chews and full-sized bags of treats. Those tough toys are particularly popular among pet parents as they’re fluff-free, so there’s no mess to clean up after puppers go wild with their new playthings. Whether curbing your own dog’s rambunctiousness or keeping the neighbor’s dog quiet in the middle of the night, the Good Life® Bark Control affiliate program sells humane electronic devices that can help get the job done. They also sell an infrared heated pet mat that is ideal for providing dogs with warmth during fall and winter or any time of year that they’re resting on a chilly floor at home. NEW WarmPet™ Infrared Heated Pet Mat by GoodLife! Only $89.95! It doesn’t matter if your site visitors are caring for dogs, cats, or miniature horses- at chewy.com, they’ll find the everyday supplies they need to treat them well. More importantly, this is also an excellent outlet for picking up name-brand pet medications at discounted prices that go a long way towards giving faithful companions plenty more years of play time with the family. Save 50% on select True Acres Dog Treats! If your patrons are looking for fast and affordable pet prescriptions, PETCO can have goods such as heartworm medications and flea treatments delivered right to their door. This well-known advertiser also has the supplies that pet owners need for day-to-day living… as well as a few fun items like officially-licensed NCAA jerseys and Star Wars Ewok sweaters to show off their fandom. Traveling can be a major concern for dog owners, as they must make accommodations for boarding their pets or hiring sitters while they’re away. Thankfully, that’s not a concern for anyone who reserves a room through the Loews Hotels (US) affiliate program as the brand’s inclusive Loews Loves Pets properties allows dogs (and cats, I guess) to stay with their family at their properties for the ultimate peace of mind. Don’t miss your chance to advertise these and other enticing National Puppy Day promotions on your landing pages via the FlexOffers.com network today!